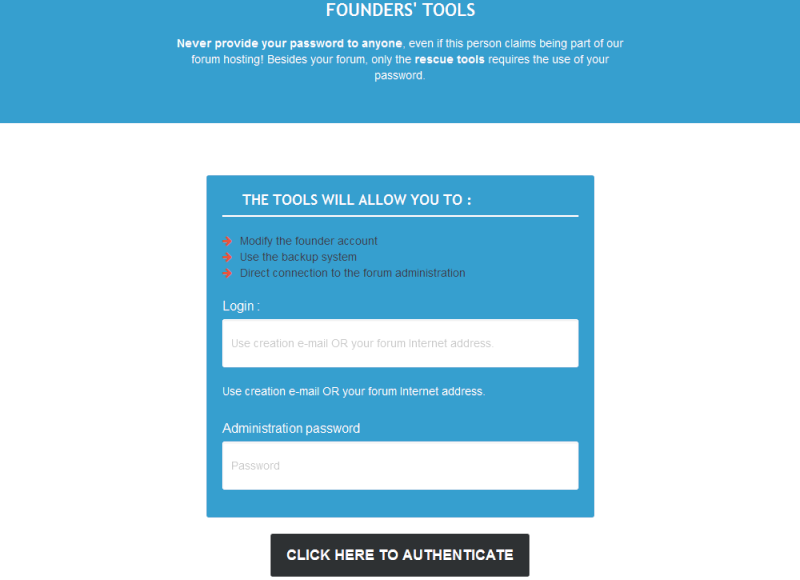 With the utilities, you have a powerful tool at hand - modify your founder information or restore your forum in case of an error or a hacker attack. You will also be able to establish a direct connection to your admin panel, in case you can't reach it through the homepage anymore (when you probably have entered a faulty or a redirection script somewhere). Any bans can be reset as well - useful for example if you banned yourself by accident. NOTE: Do not use the username and the password that you are currently using on your forum account - this won't work. The original founder information are required here to ensure that you can still restore your board, even when your forum and your account has been hacked. You also cannot create manual backups, those are created automatically. 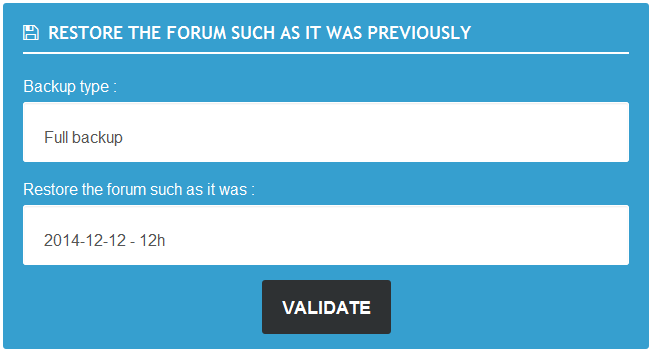 To begin restoring your forum you need to go to this site here: https://www.forumotion.com/utils . You then need to enter the password and the email that you registered with when making your forum, and click authenticate. Once you have authenticated yourself you will see a few options now available to you. Click on the button that says "Backup System"
If you removed users and messages and want to restore, select user and messages. If you have made errors with your theme or want an old one back, select theme only. If you want to restore all the above, select full back up. Once you have chosen you can now select the date and time you would like your forum to be restored back to, under the back up field in the Restore the forum such as it was field. The format will be in year, month and day, then 24 hour clock. Once you have chosen your date and time, click submit and wait. A new page will come up telling you the modifications have been done (the restore) and has a link back to your forum. Click the link and make sure your restoration has been done. Language : scotch och aye! Location : Whats harder than a rock? !